I wasn't sure whether to put this under insurance or home. Mods, please move if it's in the wrong place. So last night, my boyfriend just went to open our oven and out of nowhere, the handle broke off, one of the springs/hinges collapsed, the oven door hurtled to the floor, smacked against it and the glass shattered everywhere (see photo). We are not rough with the oven and we have no idea why this happened. It must be wear and tear. We asked our estate agents what we should do and they said "talk to your insurance". We have Swisscaution and home insurance and - sorry if I sound liek a complete idiot - but I don't know who to ask or what to do. If it's due to wear and tear, it shouldn't be up to us to pay for a new oven, should it? I'm worried our insurance won't be enough to cover it (I took out a policy for the sake of it and don't really understand it and our new policy - which is a good one I got advice on - doesn't start until July). Please can someone help? I really can't afford to fork out for a new oven. search EF. 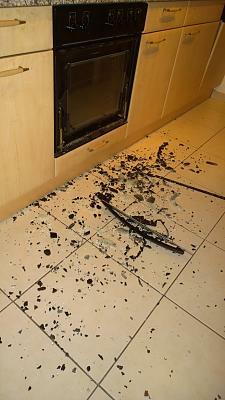 there was another exploding oven case which was covered by insurance. apparently it does happen (i think in that case nobody touched it and it exploded on its own). Ooops- but why not just phone Swiss caution and ask the receptionist to put you through to the right dpt and discuss this with them? Are you members of Alsoca? Swisscaution has nothing to do with it. That's simply a deposit guarantee. It doesn't insure anything. This is the problem - I don't know who to go to! This is such a pain in the backside... surely it should be up to the agency to replace it? Either that or we have the right to take it with us when we leave, right? My opinion, looking at that photo, is that the oven is just plain old and worn out - parts disintergrating/falling off. Owner of apartment should replace the oven. That`s why tenants rent and owners upkeep things. Same as if the geyser conks in - owner replaces it. All you have to do is show an iota of initiative and call your insurance to explain the situation and see what they say/advise... why not try that first? Arm yourself with the facts before going into a panic. Last edited by Chuff; 24.02.2015 at 15:51. Does anyone have an article of the law I can quote? I swear we did nothing to cause that damage! Last edited by Kamarate; 24.02.2015 at 15:53. Why don't you simply just ask first instead of quoting the law ? Incorrectly quoting can lead to animosity and no interest on the part of the landlord to do anything apart from the strict minimum. You RC insurance will pay anyway, damage to third party. I'm just concerned that my policy won't cover it as honestly I don't understand home insurance. Is it like health insurance where you have a minimum requirement of things that are covered? Are you perhaps trying to say that you are in fact not insured? If you are, just phone them and find out- your French is excellent, so no problem there. And as said, I'd never ever be a tenant in CH without being a member of Asloca for advice, just in such situations. No, I do have home insurance (although not a member of ASLOCA). Last edited by Kamarate; 24.02.2015 at 20:53. Calling the insurance and asking them would be the simplest thing to do. Most landlords ask for proof of liability insurance when you rent the place so I'd be very surprised if it wasn't included in your policy. You can make an appointment at ASLOCA and pay to join at the first appointment if necessary. If it was my landlord I'd call him first and explain it exploded after the handle disintegrated. (Plastics fail over time) be honest. They may replace the entire oven without quibble and no cost to you if it's an old oven (cost more to fix than replace I guess if it's old!) This might be seen as keeping the property in good order then again there are some tight landlords out there. Otherwise route 2 via insurers. Unless I've completely misunderstood her first post didn't she say she'd contacted the landlord ( agency) and their response was to contact her insurers? Swisscaution is the wrong route to go as they only cover your rental deposit. Deposit only comes into play when you move in or out of an apartment. When moving in, as a security to the agency/landlord for damages not repaired by the tenant upon moving out (either damages you haven't repaired yourself (Kleinreparatur, see Can I request a new cooker? for further info on when tenants are required to cover these) or damages which you're responsible for but haven't had your insurance (home contents insurance or liability insurance) take care of during your rental). Since you're (I presume) not planning to move out and not repair before you move out, home contents insurance is the place to call. Also joining asloca might be a good idea for next time. Not that you're not allowed to ask questions here if you're a member but they can help out pretty quickly and efficiently. BM is right, I have already contacted the agency who were very quick to shirk responsibility. I'm looking at my policy and it could be so many things but I don't see anything there that resembles ovens (sinks are apparently not covered). The only thing I can see is in the personal liability insurance which says "Material damages" and the deductible is CHF 200. I guess it could be RC as the oven belongs to the owner, not to us. GAH I can't bloody ring them as I'm at work and I honestly can't take the time to call (all the time on hold etc). My boyfriend is going to have to ring them. I just hope he can explain and get a clear answer. If your home contents and liability insurances are taken out with the same company, contacting them and asking them which insurance covers the broken oven should be clarified quickly. How about email since you can't reach them by phone now? That seems like the clearest way to deal with things. Also request their phone availability hours in the email in case your BF can't reach them by phone. Hi Kamarata. From what I can see from your photo, you must have a Bosch 60cm oven with full front glass door. Please do not panic, if it is this model, you can simply put a new glass on the front. Or at the worst, change the door. On the RH side edge of the door are all the ID Numbers you need to order a new one. If I can help, let me know. I will be in St Blaise on the 25th from 10 - 12pm.